The characteristic detached holiday homes in Buitenplaats Witte Raaf aan Zee have been built in 2016. 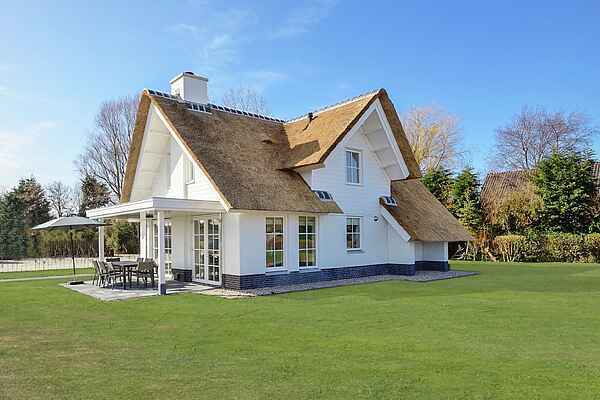 These luxury villas of type Tapuit all have a characteristic thatched roof and are available in a 6-person (NL-2204-40) or an 8-person (NL-2204-41) version. The spaciously decorated interior and the bedroom with bathroom on the ground floor make these houses very suitable for families, for example families with a "three generation set-up". Of course, you will have all the modern-day conveniences such as a washing machine, a dishwasher, and free WiFi. There are two parking spaces reserved for you on the large lots, and the private garden/covered terrace has comfortable garden furniture. In other words: a perfect base for a lovely holiday near the North Sea Coast!